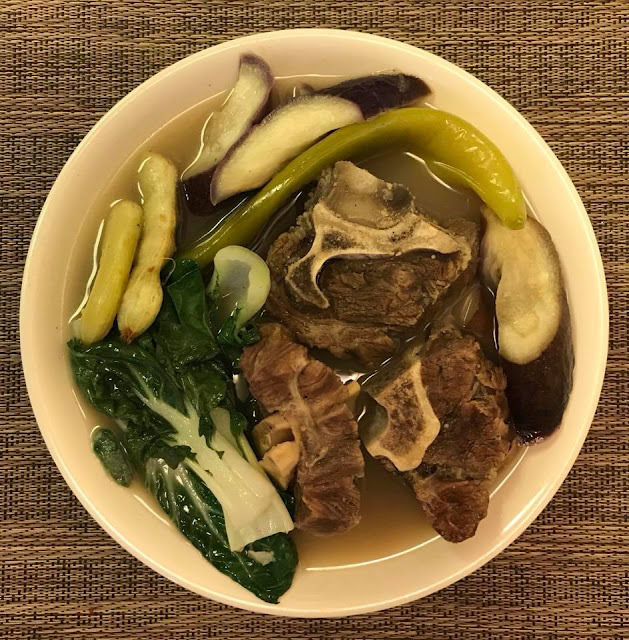 Beef Sinigang or Sinigang na Baka is a simple vegetables soup dish in a sour tamarind base. It is very easy to prepare and very satisfying. Whether its pork, beef, fish or shrimp, sinigang dish is popular in the Philippines or for Filipinos any where in the world. You can never go wrong with this simple Beef Sinigang recipe. Simple ingredients and excellent taste. You can always add more vegetables like okra, sitaw, taro or more. In a large pot put beef, lemon grass, sampalok and enough water to cover it. Bring into a boil in high heat. Skim off scums accumulated on the surface. Simmer for an hour or two until meat are tender. Add more water if needed. Season with fish sauce ad ground pepper. Continue cooking for few more minutes. Add slices of onions, eggplant and chili peppers. Continue cooking for 5 minutes or until eggplant is almost cooked. Season with knorr sinigang mix and more fish sauce or salt if needed. Add pechay and cook for few minutes. Remove pot from heat and serve with steamed rice. Enjoy.